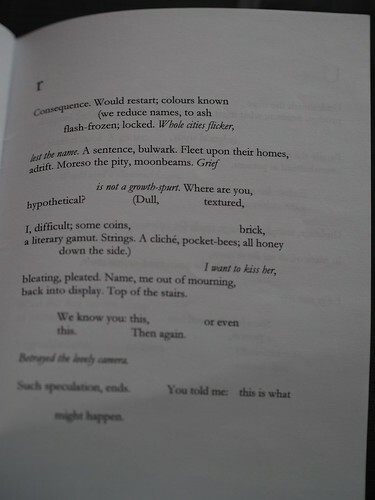 The fragment allows for the distractions of easy narrative and straightforward patterns to be abandoned for the sake of the collage or even collision of lines, phrases, stanzas and even poems to shape into something that couldn’t easily be explained, but somehow manages to exist and make perfect sense. Might be my favorite book/chapbook of rob’s thus far. For ways I can’t quite explain except alertness, scalp’s “hello, what’s this” and interest in rereading not in case I might grasp it better this time but just because it’s a pleasure to re-read. The elements came from separate births, were incongruent but grew together by juxtaposition into something musical in ideas. Each element adds together numbers, letters, colors, shapes, fonts somehow with the common denominator of language and intent making it make sense. Stepping outside parts to prove a particular pre-decided thing that can be elevator pitched, the parts add up in a way you can’t quite explain. For example in a reading at Tree 2 or 3 years ago where I can’t quite remember who was reading from what. It was non-linear, list-like, troubled in grammar and refusing narrative. He who was beside me asked me if I liked it. I shrugged, “no, I don’t get it.” “Really”, he replied, wiping tear stream on my cheek.